A captive grizzly bear at Washington State University's Bear Center. Before hibernating, grizzly bears can put on 10 pounds a day. Interior Secretary Ryan Zinke came to Washington's North Cascades Friday to make one thing clear: He wants his agency to get back to work deciding by year's end whether to reintroduce grizzlies to the North Cascades. 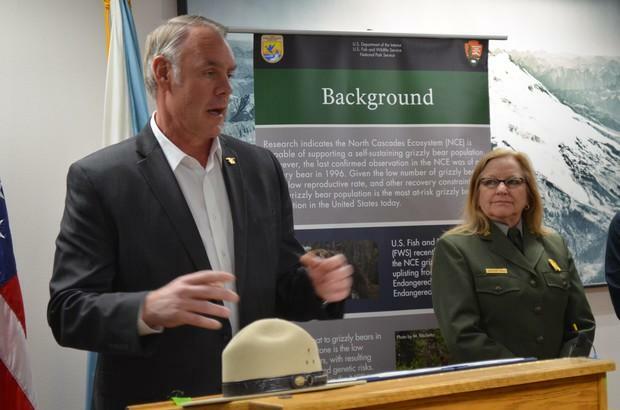 "I’m in support of the Great Bear,” Zinke told a small audience at the North Cascades National Park Headquarters in Sedro-Woolley, Washington. Zinke's announcement comes three months after news reports from Montana and elsewhere indicated that the Interior Department was halting its review of the possible reintroduction of the grizzly in this part of the Northwest. He shed some light on the decision to hit "pause" before restarting the process, saying he supports both the bear and "doing it right" when it comes to recovery. There were once thousands of grizzly bears in the North Cascades. Today, there are fewer than 10, and scientists believe, if no action is taken, grizzlies will go extinct in the North Cascades. Efforts to recover the population have been underway for more than two decades. Now that the recovery process is back on track, the Interior Department will go back to examining four options for approaching grizzly bear recovery, considering the nearly 127,000 public comments on the issue, and making a final call about if and how to handle reintroduction. One of the options is to take no action. 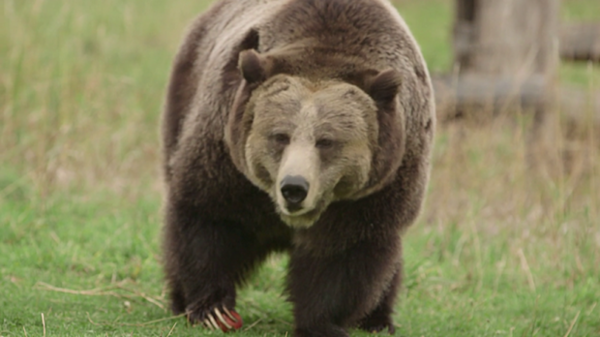 The other three options are different ways to bring grizzly bears in from British Columbia and Montana. The goal is to have about 200 grizzlies in the North Cascades within the next 100 years. Conservationists have been pushing the park to bring back the bears for decades. But many ranchers and others who live near the North Cascades National Park are opposed to the idea. "We are extremely disappointed with the Department of the Interior’s stated support for introducing Grizzly Bears to the North Cascades of Washington," Ethan Lane, of the National Cattlemen’s Beef Association, said in a statement. "Reintroducing as many as 200 man-eating predators into an area already reeling from exploding gray wolf populations is anything but neighborly. This decision won’t just impact ranchers - it’s a blow for the entire North Cascades ecosystem, the safety of locals and visitors, and the local economy." Grizzly bears have been responsible for a number of human fatalities in places where they have been reintroduced — including Zinke's home state of Montana. Biologists and researchers say at the root of many of the human-wildlife conflicts involving grizzly bears is easy access to food — like unsecured garbage or feed in inadequately fenced livestock areas — which leads to the development of "nuisance bears" who become habituated to foraging where people are. Karen Taylor-Goodrich, the superintendent of the North Cascades National Park Service Complex, says grizzlies belong in the North Cascades. "We’re restoring a species that was here to begin with," she said. “It’s going to help us restore that balance to the ecosystem. … It’s an important piece of the puzzle that’s been missing." 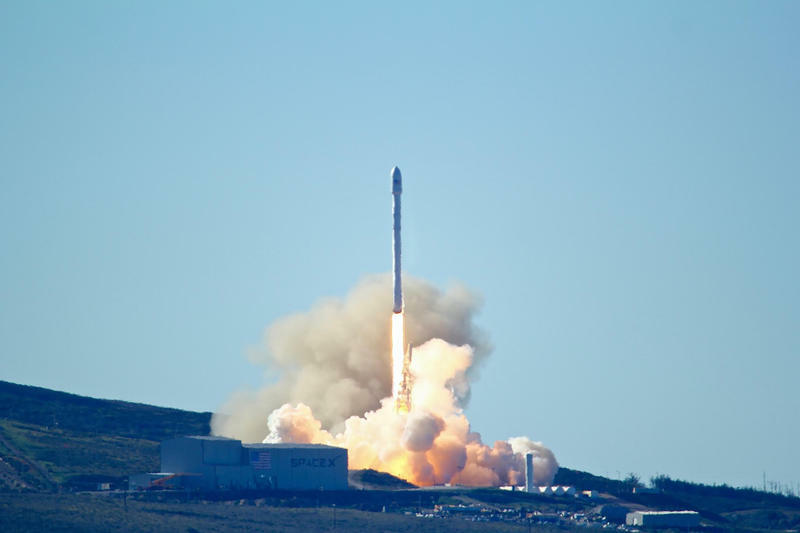 Private space companies like Jeff Bezos' Blue Origin and Elon Musk's Space-X are sending rockets into the upper atmosphere. Does more activity in space mean more pollution for Earth? That's a concern of listener Laurie McQuaig of Seattle. She asked us to investigate the issue, so reporter Katherine Banwell took the question to local science and tech expert. Alan Boyle. He says there's no need for concern at the moment — yet. The ships, trains and trucks that haul cargo around Puget Sound are pumping out less of the soot, sulfur dioxide and other things you don’t want to breathe. 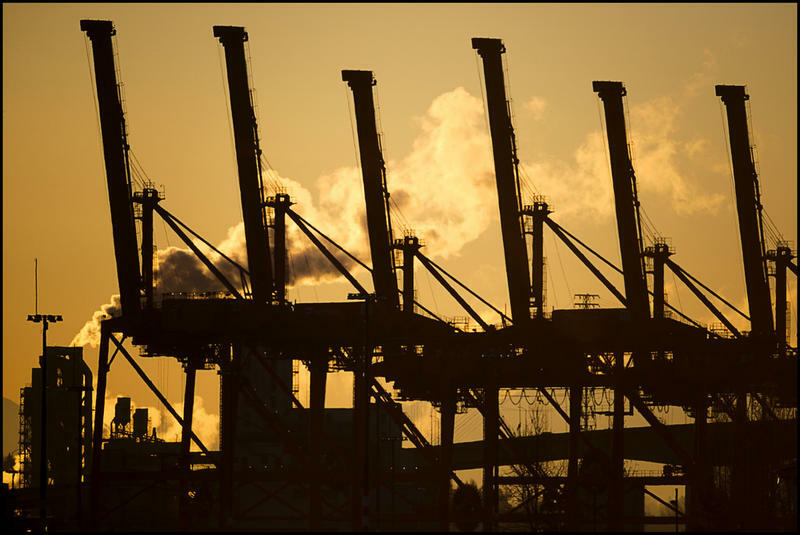 Air pollution from the ports of Seattle and Tacoma has dropped over the past decade, according to long-term monitoring released by the ports Thursday.